Statistics Canada today revised the national accounts and found Canadians are now more indebted than either the Americans or the Brits were at the peak of their housing bubble. Instead of Canadian households having a debt to disposable income ratio of 154, as was previously estimated, it has now been revised upwards to 166. So, Canadians owe $1.66 for every $1 of disposable income. The new data has disaggregated non-profits and households, which were previously lumped together. The lower debt ratios of non-profits were making the entire sector look like it had less debt—but now that households can be pulled out and examined specifically, the amount of debt they are carrying turns out to be much higher than previously thought. At the peak of the US housing bubble in 2007, Americans’ household debt ratio was 165%. The British were also riding high on household debt when they hit their peak debt to disposable income ratio of 160% in 2008. For both of these countries the ratio has declined significantly since the peak and appears to be on a downward trajectory. Looking at today’s StatsCan numbers and focusing in on the credit market debt to disposable income, not just total debt to disposable income, the picture changes dramatically in 2005. After 2005, the divergence between the pre- and post-revision data widens. 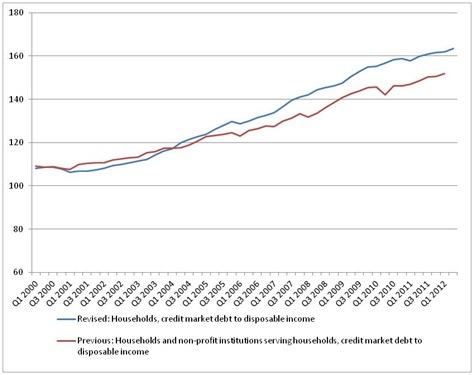 The first quarter data for 2012 reported household credit market debt to disposable income of 152%, the revised data for the second quarter of 2012 puts the figure at 163%—an 11 point increase. 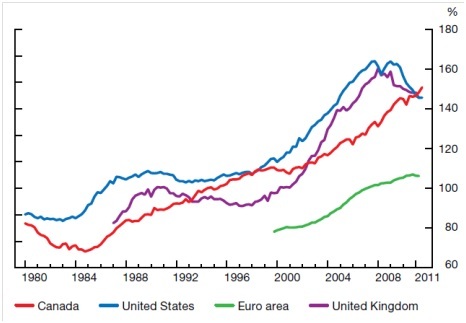 It is increasingly clear from these new figures that Canadians are over-leveraged—more so than the Americans or the British at their housing bubble peaks. The household debt situation is going from bad to worse in Canada with no clear signs that debt accumulation is slowing. Given continued emergency low interest and mortgage rates, the situation—at least in the short term—may well be sustainable. However, if interest rates rise, the situation could become more dangerous. While there are a variety of factors that got us here—slashing of CMHC insurance eligibility rules, falling mortgage rates, lax bank lending standards and eager home buyers—the fact is, we are here now. The challenge for the future is how we can stop additional debt accumulation while also maintaining home equity, which is the primary asset for retiring baby boomers.